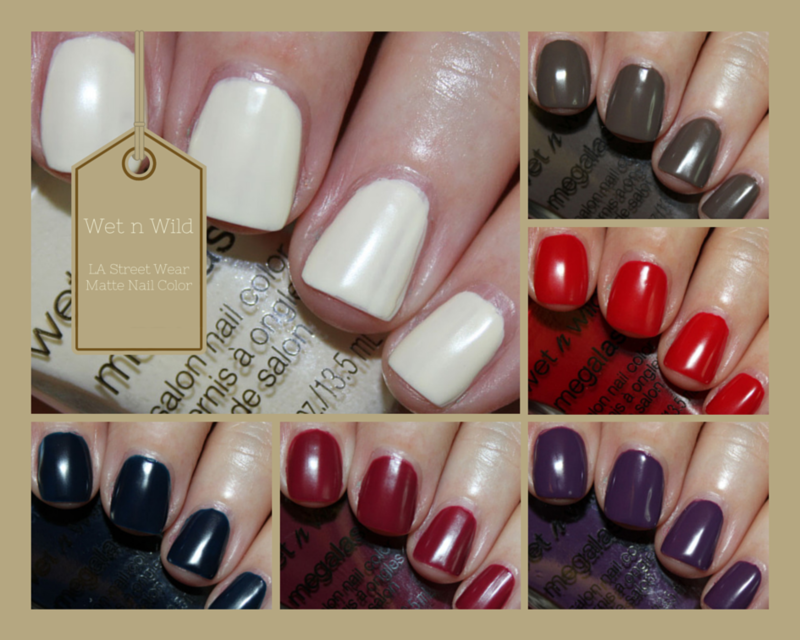 The Wet n Wild LA Street Wear Matte Nail Collection for fall 2014 is comprised of six new matte finished nail colors. You can tell the finish of these by the bottle cap, which is a matte black kind of grippy texture. I actually like this because it makes the bottles easier to open. These have their wide “ManiCurve Pro Brush” which I am not all that fond of. For some of my nails it’s just too wide, and I wind up making a mess. As far as the matte finish, they are matte, but they remind me more of the rubber-like finishes we have seen from Illamasqua or the wax finish from Cult Nails. They aren’t completely flat or a chalky type of matte. LAC – My Mani? is an off-white shade. I really, really wanted to love this one, but it just wasn’t happening. For me it was really uneven and didn’t cover nicely even with three thin coats. Love the shade and finish, but the formula wasn’t great. Distressed To Impress is a deep taupe. Oh yes, now THIS is amazing! I might have a billion taupe shades, but none with this finish. This was a perfect polish in terms of application. It was completely even, pigmented and perfect with two coats. Rouge 66 is a bright cherry red. This also had a really great formula and covered nicely with two coats. Careful It’s Vine-tage is a deep plum. I really love this shade at the moment, and the formula was really good. This was two coats. Love this finish with this color! So Berry On Trend is a berry red. I never really love these shades on me, but it did have a nice, even finish, and covered with two coats. 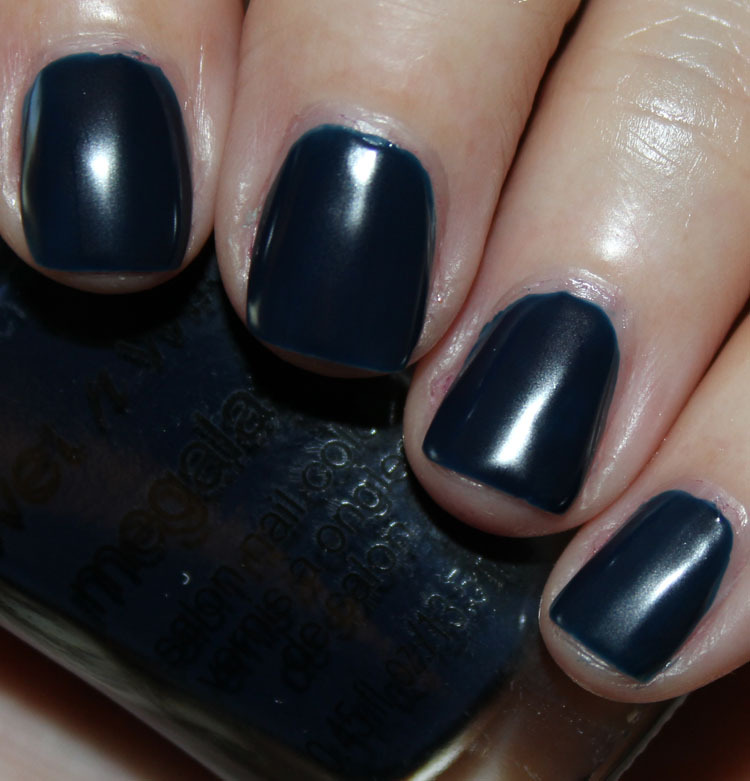 Echo Dark is a dark blue. This is a very blackened blue, but you can tell it’s not black. This too had a great formula, and it was super pigmented with one coat, but I used two. So pretty much everything here worked out really well for me except LAC – My Mani? This kind of matte finish makes me really happy because it still has this great rubbery or waxy look and I love that. You could also add a top coat to bump ’em up. My two favorites were Distressed To Impress and Careful, It’s Vine-tage. These are in drugstores now. Are you going to check any of them out?